To simplify matters, we have gathered here a collection of the most popular links we recommend you visit if you have our speed camera database. Using our speed camera data and our collections of speed camera icons, sound files and custom cursors will give you a uniquely configured device that has better features than any other! We recommend the superb icons created by GerryC, one of our voice alert packs and a nice custom cursor! Our growing library of custom cursors. Please Note: The files available on pages linked here are supplied for your personal use only. You may NOT share these files on other web-sites, distribute them or share them through P2P or TT HOME without the express permission of the author. 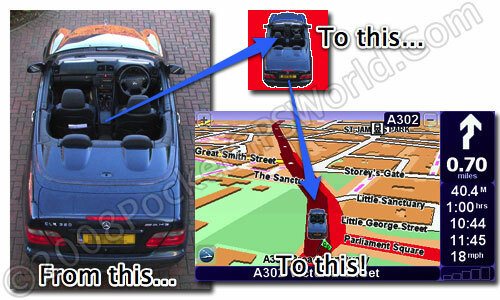 The original files remain copyright of PocketGPSWorld or the author(s) if different. Where files are not the original work of PocketGPSWorld.com they are used here with full permission of the author(s). Please familiarise yourself with the licence terms of each resource before use. Have a TomTom compatible custom cursor of your very own car, a unique one of a kind custom cursor. All we need is a digital photograph. We need the photo to be taken (from behind obviously!) and if possible from above for the best 3D effect on your maps. If you can get one taken from the same angle as the example below it will yield the best result. *This offer is open to current subscribers only. PocketGPSWorld.com Ltd retain copyright of the resulting cursor artwork and may publish the cursor to our download library for download by other users. We will as a matter of course obscure your registration from any publicly hosted version. 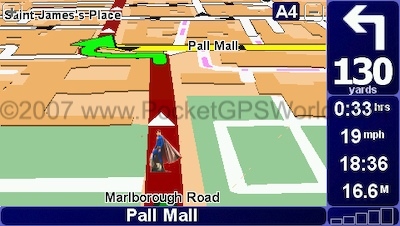 You may not use the custom cursor for financial gain nor offer it to other web sites for sale or otherwise without the prior permission of PocketGPSWorld.com Ltd. Please email any requests (with attachment in .jpg format) to me via my email address (Darren) found here. Have any comments about this page? Post them in the forum thread below. I don't know if this will work - a poor thing, yet mine own! For the Older backseat driver!